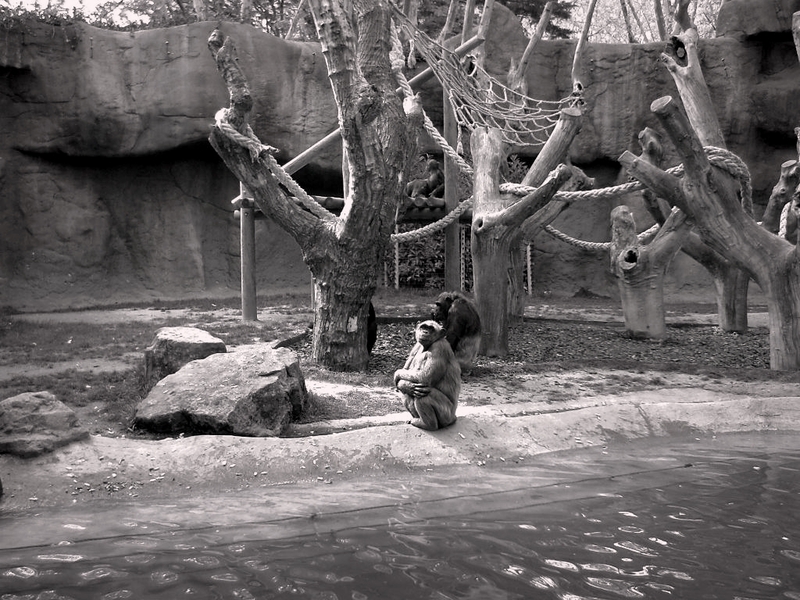 Today I am experimenting with BW in this shot taken at Barcelona Zoo. The chimp in the picture seems to be sad and fed up, so I put words in his/her mouth: I wanna go home! or maybe I feel sorrow for you!. No matter how well conditioned zoos are, nothing can replace an animal's natural habitat, and we don´t have any right to do this just to satisfy our curiosity. Explore Barcelona Zoo Satellite Image on Google Maps. Carlos, I am in 100% agreement with you. Foe this reason a have never taken my kids to the Zoo or the circus. Saw your blog through Bob's. Glad I stopped by. No one has a right to keep animals from their true home. I love this photo because it brings the point home. I do agree about the loss of animals' natural habitats but with the humans need for modernization, I'm thankful this little buddy has somewhere to live. His natural home may be a holiday resort now. When i was a little child, i saw a doe (une biche, en français)in an Austrian zoo and this gentle animal was throwing herself on the wire netting...So sad, i do agree with you. Let's see I am no Greenpeace or PANDA activist, I see what you mean Carmen and Edwin. It's not just black and white there is also some grey. I just find that it is not fair. Thanks Alice for support. Thanks to you all for the debate and comments on such important issue. I also visited the zoo recently and actually cried when I saw the Rhinocerous!! It was the saddest thing I have ever seen, which is why i'm trying to find some way to do something about it...hopefully virtual zoos are the future, and eventually animal santuaries will abound.